Note: this post is much more detailed than usual, so if you'd rather listen than read, I've prepared a similar, but not identical, guide via video. Just scroll all the way down to the bottom! When I scored this Herschel backpack for only $47.59 (retail $100! ), I was absolutely elated--knowing you got an incredible deal is one of the most satisfying feelings. So in lieu of an outfit post today, I'll be sharing my personal bargain shopping tips, as well as how I managed to get this gem of a backpack for more than 50% off retail (see number 6). 1. Keep an open mind Total brand-consciousness is a hindrance when it comes to true bargain shopping. Yes, I do like nice things and often oogle over designer items, but I also have no problem buying clothes at Target; a good chunk of my closet is from there, from $7 edgy sweaters to $6 polished flats. If it's cute and inexpensive, then why not? Style isn't about where your clothes are from; it's about your personal eye for aesthetics and how you carry yourself. And honestly, you can find pretty pieces almost anywhere; I've picked up a nice scarf for only $2 at my local grocery store before! 2. Find sales and dig Clearance racks are your good pals. Spend a lot of time with them, especially if there's a promotion like H&M's "buy one get one for a penny" or American Eagle's "extra 40% clearance." It can be overwhelming at times, especially if you compare the disheveled potpourri of clearance items to the polished regular sale racks, but I promise it's worth it. You'll not only save money, but you'll also save time; there are many regular sale racks dispersed around the store, but there are only a few concentrated clearance racks. I also recommend shopping sales between seasons and after Christmas, because that's when retailers are looking to clear out space for new shipments. 3. 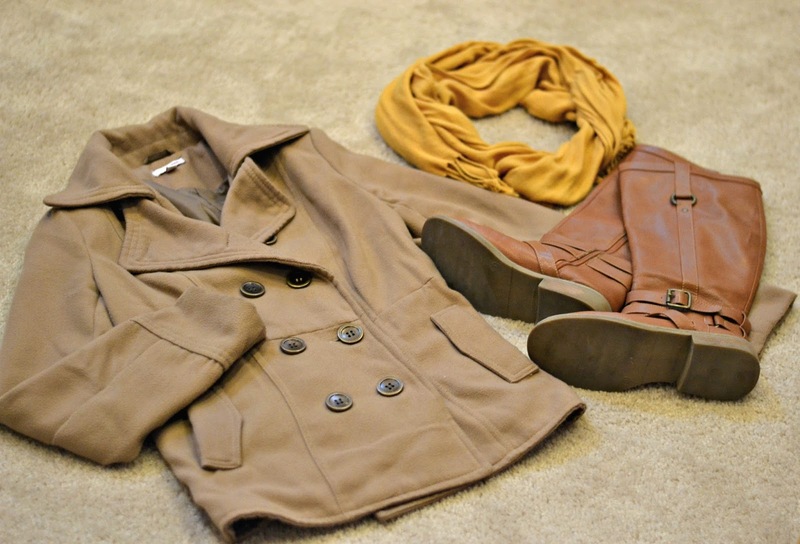 Shop off season $10 riding boots, peacoats, and formal dresses? Yes, please. This is my favorite shopping tip because it's one of the most effective, particularly for seasonal pieces or formal dresses. For winter items, I've noticed that shopping February-April yields the best results. For formal dresses, I've noticed that going anytime other than homecoming or prom season is on point (November-February or June-August). Macy's, in particular, has a wide selection of deeply-discounted formal dresses in the off-season. It's not like I have three unworn $10 dance dresses from Macy's in my closet or anything...but in all seriousness, I would definitely recommend getting a head start for formalwear; if you'll only wear a dress once, it's best to get as good of a deal as possible on it. So all you high school girls: shop for your homecoming dresses now! 4. Be patient See it in a glossy ad and want to have it now? Hold on, girl! I've been in your situation multiple times in my life, but I've found that simply waiting leads to the best purchase. Often times, regular price items will go on sale in about a month (hello floral dress for only $10 instead of $30). If you aren't willing to take the risk that it may sell out, then wait 24 hours and ask yourself if you really need it (also see number 9). 5. Search for coupons If you frequent a store, sign up for emails or get their rewards card, especially if you don't need to open a credit or debit card (i.e., both American Eagle and DSW have this option). If you're afraid of junk mail, create a specific email just for promotions. While coupons are obvious for in-store shopping, it's easy to forget that there are a plethora of valid coupon codes online! One of my favorite sites is RetailMeNot, but you can also just google "[store] coupons." Just from a quick search, I've saved plenty of money on shipping, or have even scored extra discounts. 6. Go online Finally time for the story of how I got my backpack. I had first seen a friend carry it and thought it was the perfect package: both roomy and sturdy without sacrificing style. Well $100 is definitely something I'm not willling to pay for a backpack, perfect as it is (me and my cheap tendencies). Luckily, it was on Amazon in my favorite print for only $71.99. I already had a free $10 gift card from Swagbucks--a site where you can take polls, watch ads, play games, ect. to earn Swagbucks and then redeem them for gift cards, magazine subscriptions, galore--so I was going to grit my teeth and throw down $61.99 for a backpack. Luckily, I followed intuition and googled "Amazon coupons," and lo and behold, there was a 20% off fashion promotion--all you had to do was enter your email! So this girl clicked "place order" with a huge grin. On to the actual tips: I cannot stress enough how useful online shopping is for saving money, especially on big purchases. I've even gotten both my prom dresses on Amazon for under $50 each (see here and here)! Amazon, of course, is one of my favorite resources, though I have dabbled in ebay. If you're wary of online shopping because of possible unscrupulous sellers and poor quality items, be sure to check the seller rating and item reviews. When I buy online, I pore over customer reviews to make sure I order the right size and receive a top-notch product; I rarely buy if there are no reviews. If you simply proceed with caution, all should go well. 7. Try discount outlets If you're looking for more high-end brands, stores like TJMaxx, Marshalls, and Nordstrom Rack are definitely go-to for good deals. Here you can find discount designer shoes including Coach and Steve Madden, marked down Nike sports gear, and a wide variety of clothes, including brands such as American Eagle. I've even snagged a multi-color Hurley tank top for only $1 at Marshalls (worn in this post here)! While not all items will be as extreme bargains as that was, there are still plenty of money-saving finds. Personally, I like to shop for socks, running shorts, athletic bags, and beauty products at these stores. 8. Pop some tags/go thrifting I'll be completely honest: I used to avoid thrift stores as if they had contagious illnesses. But once I got over the funky smell and cluttered racks, I've never looked back. While there certainly are your stereotypical ugly holiday sweaters and grandma knits, there are also of-the-moment finds at ridiculous prices. Take this $4 Express sequin skirt in this post, for example. You can also find some stylish designer pieces--I've picked up a classic J. Crew sweater for only $5 at Goodwill before! Many thrift stores will also have new Target items at discounted prices. In addition, thrifting is environmentally friendly and often charitable (i.e. Goodwill and Volunteers of America). A word of caution, however: be sure to inspect your clothing carefully before purchasing, especially if it has lace; since most thrift stores are donation-run, pieces may sometimes be damaged. 9. If you splurge, splurge on a versatile item Less of a bargain shopping tip, more of my personal shopping philosophy. While I normally can't bear to spend over $15 on a single piece, sometimes the extra money is worth it. For example, I am much more willing to drop $30 on a pair of brown ankle boots that I can wear with anything than on a pair of multicolor Sperry's that are difficult to style. So use your best judgment. While you're considering an item, envision your closet and mentally create possible outfits. If there are countless options, go for it. If not, then let it go. Some of my favorite items actually have been splurges for me, like this brown and black striped blazer in this post and this post, and these ankle boots in this post. This post was not sponsored in any way. Just wanted to share the love and possibly save you some money! I am definitely one to shop off-season! I think I've purchased like four jackets or blazers this summer and countless pairs of colorful socks, haha. It's amazing what you can find! I never really thought of buying boots in the summer, though, so that really is a great tip I'll have to utilize in my own daily life! This is all such great advice, Lily! hey, Lily! wow, a video, that's a cool surprise! and you did a great job with it. it's definitely impressive when your first video ever turns out to be so good and fluent (Y). now, when it comes to the topic of today's post I must first say Estonian stores and merchandise can't be compared with the ones you're having over there. almost everything is overpriced here (especially clothes, shoes etc.) and we don't have proper sales like you have over there. even our outlets have absolutely insane prices. so yeah, shopping in Estonia is not the easiest when you care about the money you've earned with hard work :P I pretty much don't buy anything with full price (I mean stuff you can buy while sales) and even when there are sales I still think very hard because like I said, good sales are very rare here. so that's why thrift shops are my biggest friends over here. I get pretty much everything I need from those places and even then I have my limits, haha. I think 10 euros have been the most I've paid for an item in a thrift shop but that was a luxurious faux fur coat and it was worth the price. all in all I think it's useful to know your limits and stick to them most of the time. of course there can be some moments when you reward yourself with something special and pricier. but most of the time there should be an order in your own logic and head. buying stuff just because of buying and owning shouldn't be an option. What a savvy guide, and the results are outstanding! Live everything you got Lily! ohh these are some really nice tips! They actually come at a great time since my back to school/collehe (!!) shopping is going to happen this week. I agree with you that keeping an open mind is important. Target has cute things and even my friends love some of the items I get there! Shopping off season is a huge way to save money! I noticed that during bikini season, all the bathing suit tops were ~30 dollars and bottoms weere ~20. Now I'm looking on the same site again and the tops are all under 20 and the bottoms are 10!! How crazy! I got myself a pair hehe! I haven't been thrifting yet, but I am curious. I have the same fear that you used to have, but I may give it a try. I have seen some really cute thrifted items with unbeatable prices hehe! !